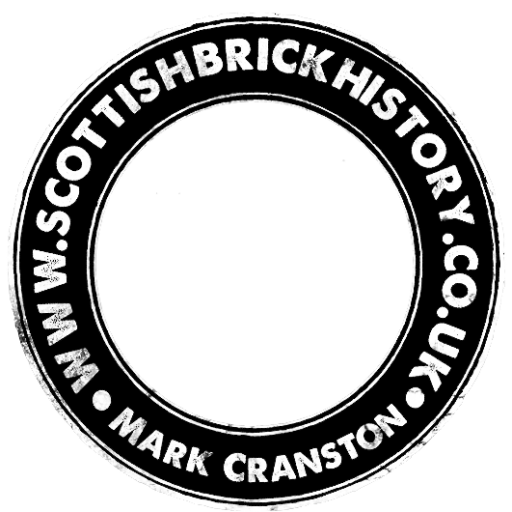 Home / Scottish Brick and Tile Industry / Shields Brick and Tile Works, Tradeston, Glasgow. Shields Brick and Tile Works, Tradeston, Glasgow. 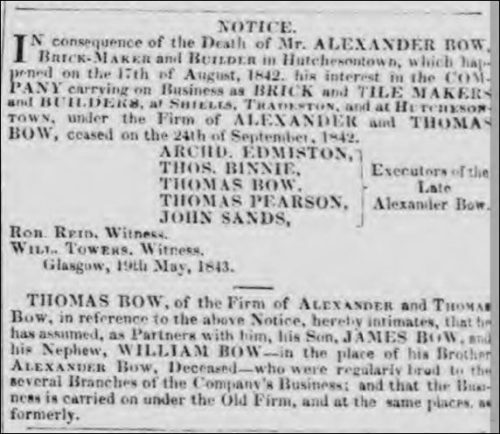 Alexander and Thomas Bow, Brick and Tile makers, Shields brick and tile works, Tradeston, Glasgow. 1835 – 1836 – A. & T Bow, Brick and tile makers and builders. Works at Shields West Street, Tradeston. A. Bow of A & T Bow. House 43 Crown Street. 1836 – 37 – A. & T Bow, Brick and tile makers and builders. Works at Shields West Street, Tradeston. A. Bow. House 43 Crown Street. 1837 – 1838 – A. & T Bow, Brick and tile makers and builders. Works at Shields West Street, Tradeston. A. Bow of A & T Bow. House 46 Rose Street, Hutchestown. 1839 – A. & T Bow, Brick and tile makers and builders. Works at Shields West Street, Tradeston. A.Bow – House – 73 Crown Street, Hutchesontown. 1840 – 1841 – Bow, A. & T., brick and tile makers and builders. Works at Shields West Street, Tradeston. A. Bow of A & T Bow, Bow House, 70 Crown Street, Hutchesontown, Glasgow. 1843 – 1844 – Bow, A. & T., brick and tile makers and builders. Works at Shields West Street, Tradeston. Counting House 5 Govan Street, Glasgow. Below – 29/04/1844 – Glasgow Herald – Thomas Bow now in partnership with his son James Bow and nephew William Bow. 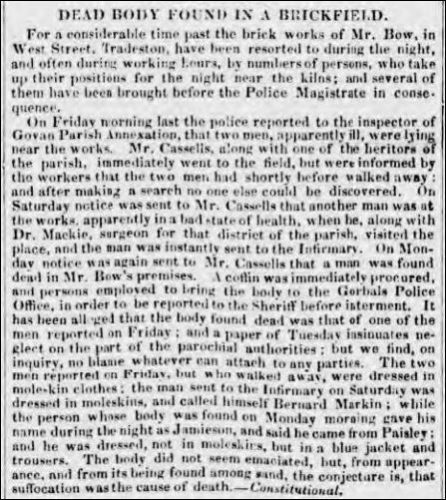 Below – 24/09/1847 – Man found dead at Brick Works owned by Mr Bow. 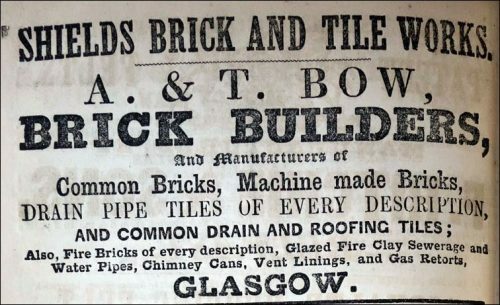 Below – 1852 – Advert Shields Brick and Tile Works – A & T Bow. 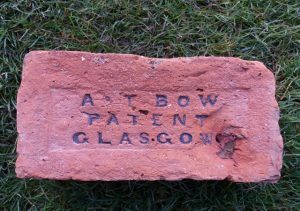 1852 – 1853 – A & T Bow, Brick makers, 45 Govan Street, Glasgow. 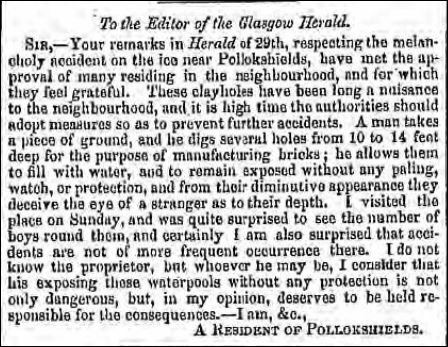 25/04/1853 – Glasgow Herald – To let unfurnished at Pollokshields. The Corner Villa of St Andrew’s and Shield’s Roads containing dining and drawing rooms, four bedrooms, kitchen and scullery and washing house with garden and shrubbery in front. 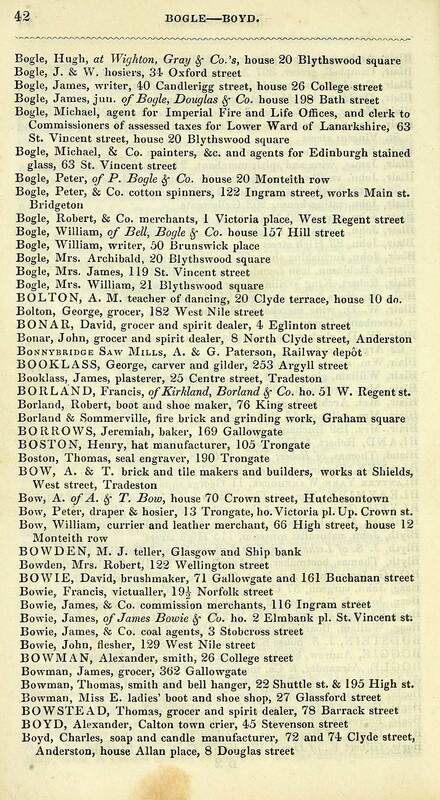 Apply A & T Bow, Shields Brick Works or R. Bald, 174 Trongate. – Glasgow 21/04/1853. 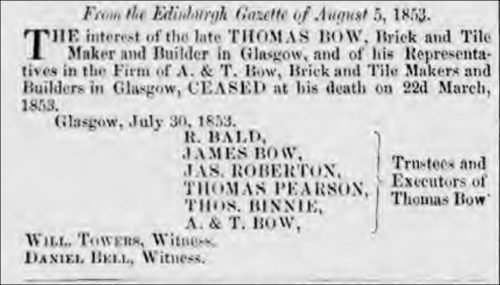 Below – 08/08/1853 – Glasgow Herald – Thomas Bow, brick maker died on 22/03/1853. 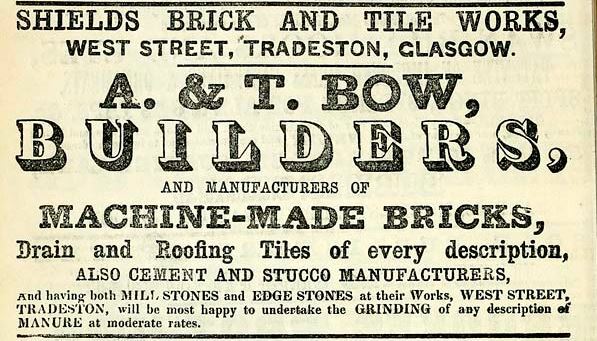 1855 – A & T Bow, Shields Brick and Tile Works, West Street, Tradeston. 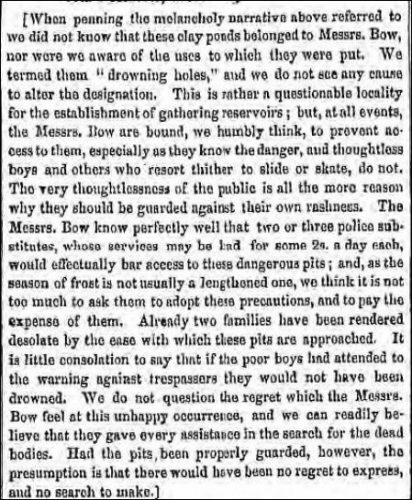 Below – 13/12/1856 – Glasgow Herald – A & T Bow – Clay holes under fire from Newspaper and Public following an accident there. 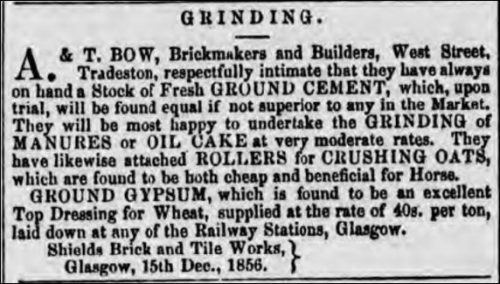 02/01/1857 – Glasgow Herald – Grinding. A & T Bow, Brickmakers and Builders, West Street, Tradeston, respectfully intimate that they have always on hand a Stock of Fresh ground cement, which, upon trial, will be found equal if not superior to any in the Market. They will be most happy to undertake the grinding of manures or oil cake at very moderate rates. They have likewise attached rollers for crushing oats, which are found to be both cheap and beneficial for Horses. ground gypsum, which is found to be an excellent Top Dressing for Wheat, supplied at the rate of 40s. per ton, laid down at any of the Railway Stations, Glasgow. Shields Brick and Tile Works, Glasgow, 15th Dec., 1856. 1859 – Bow, A. & T., brick and tilemakers, builders, and cement and stucco manufacturers, 230 West street, Tradeston. Below – 27/07/1859 – Glasgow Herald – James Bow of A & T Bow – claims to be settled due to death of James Bow. Below – 09/01/1860 – Glasgow Herald – A & T Bow grinding oil cakes and manures. 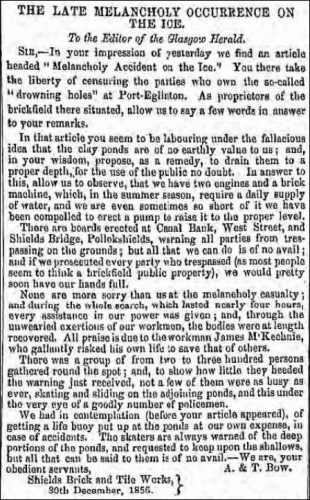 Below – 17/02/1860 – Glasgow Herald – To Let Havelock Villa, Pollockshields. 16/04/1861 – Glasgow Herald – To Let – in West Front of New Terrace, Pollokshields, a first class house in first floor containing 6 rooms and kitchen with bathroom and all conveniences. Rent moderate. Apply A & T Bow, Shields Brick and Tile Works. 1861 – A & T Bow, Brickmakers and Builders and drain pipe and roof tile manufacturers, Shields Brick and Tile Works, West Street, Tradeston. 1863 – 1864 – Bow, A. & T., brick and tilemakers, and builders, Shields works, 230 West street, Tradeston. 1865 – 1866 – Bow, A. & T., brick and tilemakers, builders, &c., Shields works, 230 West street, Tradeston. 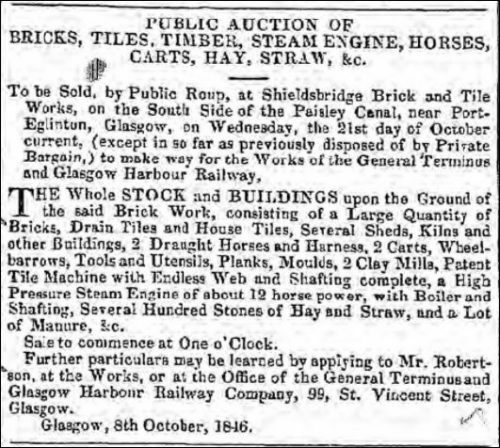 18/07/1866 – Glasgow Herald – Bricks for sale at Shields Brick Works. 130 West Street, Tradeston. 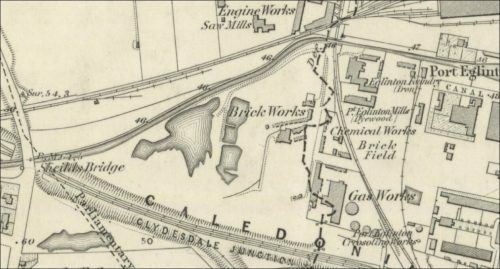 1866 – 1867 – Shields Brick and Grinding Works, and Irish Limekilns, 230 West st.; office, 137 West George st.
1867 -Brickmakers and builders ,62 St James Street, Kingston, Glasgow. 1867 – 1868 – Shields Brick and Grinding Works, and Irish Limekilns, 130 West st. ; office, 54 St. Enoch sq. 1867 – 1868 – Baird, Son, & Co., Shields Brick Works and Grinding Mills, 130 West street, Tradeston; office, 54 St. Enoch square. 1868 – 1869 – Wallace, John, brickmaker and builder, Shields Brick Works, 130 West street; house, Bloomvale lodge, 82 Crownpoint road. 1868 – 1869 – Shields Brick and Grinding Works, and Irish Limekilns, 130 West street. 1869 – 1870 – Shields Brick and Grinding Works, and Irish Limekilns, 130 West street. Previous Article Arniston Coal, Lime & Brick Works, Gorebridge, Midlothian. Found in Glasgow. 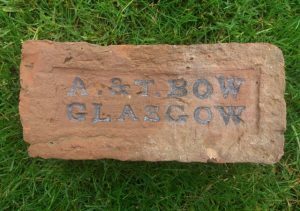 A & T Bow, Brick and Tile makers, Shields brick and tile works, Tradeston, Glasgow. . . . . Below – The same stamp on a bigger brick. Found by Michael Fallone in the Glasgow area. Found by Michael Fallone in the Glasgow area. 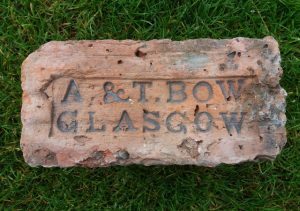 A & T Bow, Brick and Tile makers, Shields brick and tile works, Tradeston, Glasgow. 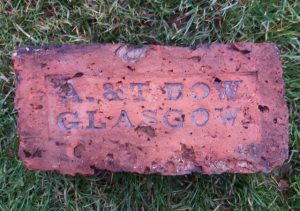 . . . .
Found Helensburgh A & T Bow, Brick and Tile makers, Shields brick and tile works, Tradeston, Glasgow. . . . .